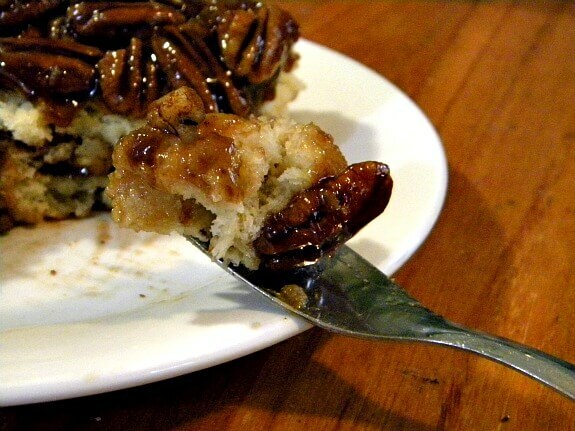 Who doesn’t love gooey, sweet pecan sticky buns? They are amazing when they are fresh and warm, dripping in buttery caramel with the aroma wafting through the house and making your tummy rumble. The problem is that they are a pain to make and you’d have to get up at 4 a.m to have them ready for breakfast, right? Well, not quite. These do take a little time to put together but they rise in the refrigerator overnight. 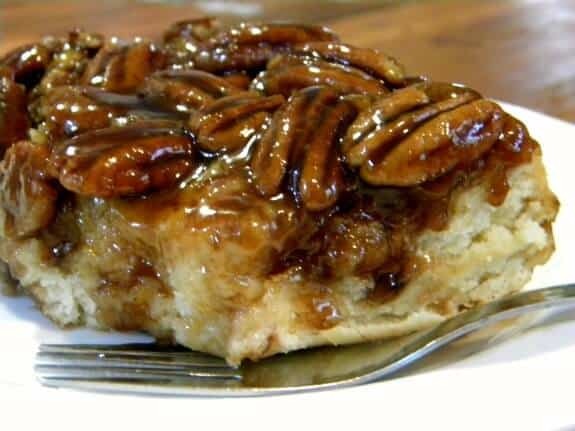 The next day all you have to do is put the pan of risen pecan sticky buns in the preheated oven and bake them for 30 minutes – a feat easily accomplished while you are in the shower or opening gifts on Christmas morning. Because, yeah, these work great as a holiday breakfast. If you want to make these even quicker you can let the dough rise in the microwave. Just microwave it at 10% power for 5 minutes, let rest 5 minutes and then at 10% power for five more minutes. Let rest for 5 minutes more and you should be ready to go. How easy is THAT? In large bowl, mix 1/2 cup of the flour, the sugar, and yeast. Add milk, salt, 1 1/2 cups of the flour, vanilla, butter and egg. Beat on low speed one minute, scraping bowl often. Beat on medium speed for 1 minute more. Stir in remaining flour, one cup at a time until you have a soft dough that is easy to handle. On a lightly floured surface knead the dough about five minutes or until smooth and elastic. Place in a greased bowl that is twice the size of the ball of dough; turn to coat all sides of the dough. Cover and let rise in a warm place for about 1 1/2 hours or until double and an indentation remains when you poke it with your finger. Heat 1 cup of brown sugar and 1/2 cup of butter to a boil, stirring constantly. Stir in corn syrup and cool for a few minutes. Pour into the bottom of the greased 13 x 9 inch pan and sprinkle with pecan halves. Mix 1 chopped pecans, bacon,1/2 cup brown sugar, and cinnamon together. Mix melted butter and bacon grease. On a floured surface roll out the dough into a 12 x 10 inch rectangle. Spread melted butter mixture over dough. Sprinkle with the pecan mixture. Roll up tightly and pinch long edge of the dough to seal. Cut in 12 slices and lay cut side down over the pecan-caramel mixture in the pan. Cover tightly and place in the refrigerator for 12 to 24 hours. Uncover rolls and bake for 30 minutes, or until tops are golden brown. Remove from oven and turn out onto a heat proof plate. Let pan remain over the rolls for a minute or two to ensure all of the caramel drizzles onto the rolls. I’ll take a whole pan! they are pretty hard to resist!